Things are moving at breakneck speed in the competitive arena of National Aboriginal Art Galleries! Both the NT and South Australia are holding nothing back in selecting sites, on their respective design competitions for new buildings, on recruiting staff and in laying down guidelines for their operation. Of course, the NT had a head start in a sense as the incoming Labor government had committed to such a project in their election manifesto in 2016 – though not to the full funding of the project. 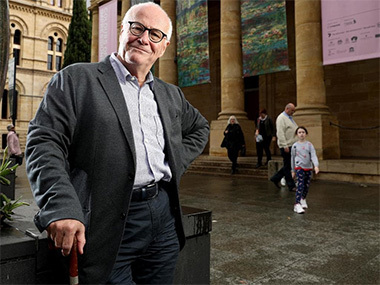 In SA, it was the incoming Liberal government earlier this year which decided an existing plan for a contemporary art gallery on the city's Royal Adelaide Hospital site would become exclusively Indigenous. But one factor links the two projects – Michael Lynch AO, CBE. For the former Sydney Opera House, London South Bank and West Kowloon Cultural Precinct boss sat on the now-wound-up Steering Committee for the NT project; at the same time he was also on the steering committee for SA's original contemporary art project, rising to chair the jury for the international design competition, to assist in the recruitment of the person who'll be Director of the new (and the old) gallery following Nick Mitzevich's departure for Canberra, and to provide continuity on the Adelaide Contemporary proposal in the new political climate. He's even moved to Adelaide to keep close to it all. His opposite number in Alice Springs is Dr Mark Crees, Director of the Araluen Art Centre there. He's now also the Interim Director, Project Implementation Team, National Aboriginal & Torres Strait Islander Art Gallery (NATSIAM), handing over to the new Director once the recruitment process is completed. And applications for that Director and the head Curator have already closed. See how fast things are moving! In the meantime, Mark Crees's role will lead the development of governance frameworks and operating models so that Aboriginal and Torres Strait Islander majority governance and management emerges as central to the operations of the NATSIAM, lead the stakeholder consultation process, initiate the design and construction process for “a spectacular building”, and oversee major inter-jurisdictional partnerships. What a lot of jargon! Fortunately, Crees went on the local Alice radio the other day to amplify – though he had to work hard to shift the local narrative from the on-going row over the government's siting of NATSIAM on the town's ANZAC Oval, which currently has multiple other uses, and was not the preferred site of the Steering Committee, co-chaired by Hetti Perkins. 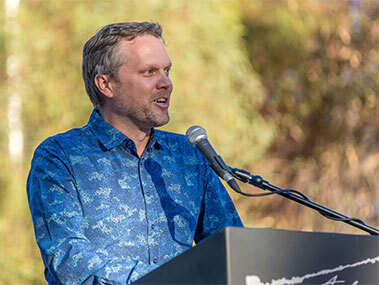 “The creation of the National Aboriginal Art Gallery as the flagship international art museum dedicated to Aboriginal and Torres Strait Islander Art here in Mparntwe/Alice Springs is incredibly important”, he said, confusing me slightly by leaving out the TSI from the project's official title and then adding it back in. For, one of the key arguments for such a national institution's placement in Alice Springs is its proximity to all of the Desert art movements – pioneering Hermannsburg and Papunya, Yuendumu, Utopia, the APY Lands, etc. It's not that close to the Torres Strait – or even Arnhemland and The Kimberley. And it's going to be really hard to collect a significant representation of the "full depth and breadth of Aboriginal art," which Crees referred to, so late in the day. Which is where “major inter-jurisdictional partnerships” come in. For Crees clearly believes that the wealth of Indigenous art often lying in the vaults of other State institutions which have been collecting since the 1980s, can be winkled out as touring exhibitions for NATSIAM – with perhaps some scholarship and a decent catalogue emerging from the Red Centre to justify the loan. It does also have the call on work in the Museum & Art Gallery of the NT's collection in Darwin – fabulous early Papunya boards seen last year in Tjungungutja and the accumulated Telstra Collection from 34 years of the NATSIAAs. But will the Art Gallery of SA lend its Aboriginal art to NATSIAM? For clearly current thinking would lead to AGSA needing it all for its own National Aboriginal Art and Culture Gallery, which is speeding along too, with six potential designs from an international competition (under the old name of Adelaide Contemporary) about to be unveiled. “I think Adelaide may have surprised itself with the calibre of the people who have constituted the six teams,” Michael Lynch told the Adelaide Advertiser. “There’s been a real sense that it’s a fantastic site to build a new gallery”. But, talking of contemporary, Lynch continues to tout the benefits for Adelaide of being able “to show the kinds of contemporary art being seen in other capitals – Patricia Piccinini’s latest show at GOMA, for instance, Ai Weiwei’s mammoth piece currently on show at the Biennale of Sydney, and the economic benefits of contemporary art spaces such as MONA in Hobart”. Which all raises for me the logic of a division of responsibilities. For clearly, they can't both be THE National Aboriginal Art Gallery of Australia. Should Adelaide's contribution to our national (and international) understanding of Indigenous life, belief systems, art and Country be an emphasis on that word 'Culture' in its title? For the SA Museum, just down the road from the AGSA, has a fabulous collection from South Australia's time governing the NT as well as its own lands which could really be put to powerful use in educating us to appreciate the art as well as the people and the society that continues to create it.